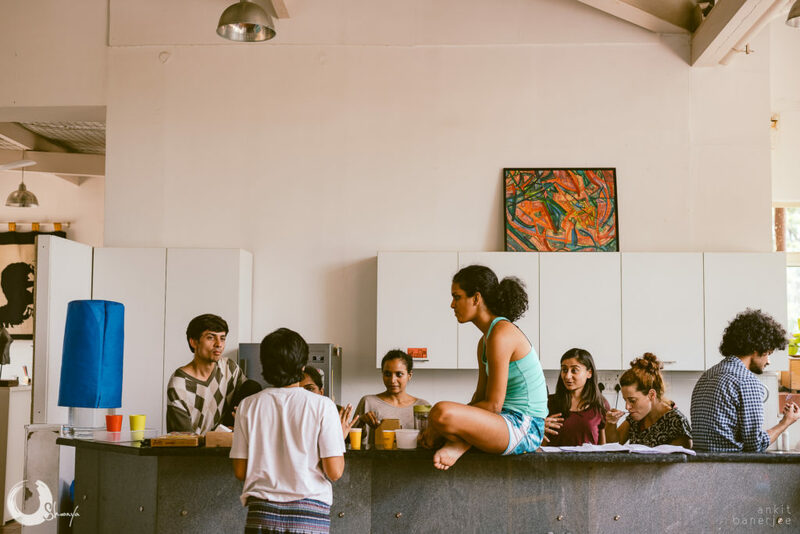 At Shoonya you might encounter the songs of Kabir wafting through the air or the jagged edges of an experimental soundscape, the dhoom-dhamaal of bodies against sprung wood floors and the smell of fresh coffee or spiced chai. You may hear a twinkling of the wind chimes, a rustling of the palms, the chatter of overworked artists, the laughter of overworked artists, the daily azaan, the traffic of dusty lal bagh road and the click clacking of keyboards in the office. The crows, the cars. The blowing wind, the thundering rain. If you listen closely you may even hear the plants growing, the kites circling way above, the dragonflies buzzing outside studio windows, the candles burning and all the wild hearts beating. You might see people moving, dancing, acting, performing, singing, training. All kinds of people. Breathing. Thinking and feeling. You will see them cooking in the kitchen, sharing lunch and heart ache. Sweaty bodies, present bodies, open eyes and power. You will see people searching, asking, listening. You will meet the plants, the floor, the walls and the open sky. You will see busy, committed, creating individuals and collectives. You will see people pause and reflect. You will feel the pause. You will feel the impulse to move. Shoonya’s main studios are located here. 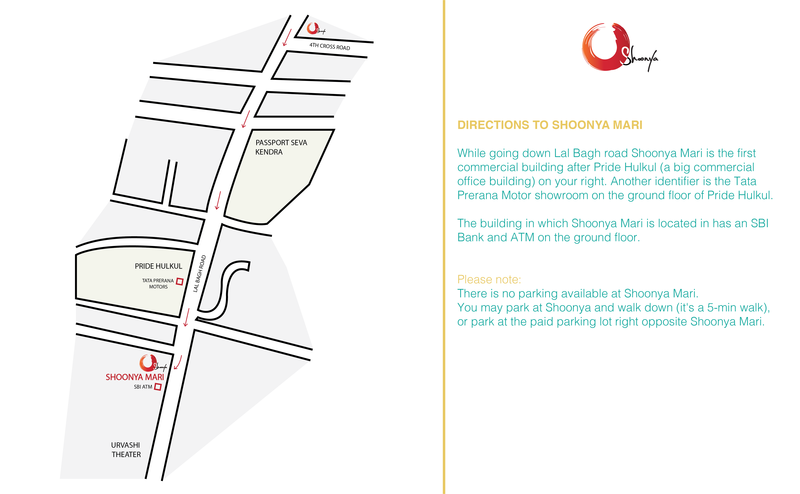 Shoonya Mari is located here. Shoonya is an alternative space for the arts. 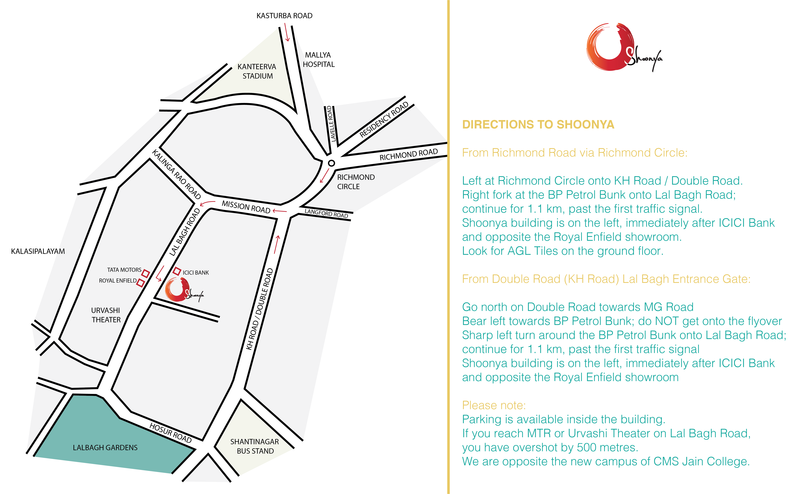 Shoonya has been painstakingly designed to be an open, expansive and warm space for the community. It is also designed to be an alternative space. A calm space for reflection, for connection, for joy. And as such we are not a traditional space for performances and events. There is floor seating at all of our performances. Only a limited number of chairs are available for those who are less comfortable on the floor, due to medical or health reasons. Do get in touch with us beforehand so we can do our best to accomodate you. Footwear, food, and liquids (except water) are not allowed inside any of our studios. Although Shoonya feels like an oasis in the midst of Bangalore’s chaos, the venue is not designed to be soundproof. So you may hear the occasional sounds of traffic, Imams, temples and birds while you are here. We hope that you embrace these sounds as part of the experience, as you would any open air community space. Shoonya has gender neutral restrooms to respect the gender spectrum. Shoonya is a shared space, created for our community to enjoy and feel ownership of, please treat it with respect, as you would a space of your own. We have limited parking available at the premises. Please take the lift in the rear building up to the 3rd floor and climb up a flight of stairs to the 4th floor. We welcome children to many of our performances, but ask that parents are sensitive to other audience members. Please do remember to turn your phones off or put them on silent (not vibrate) during a show. Thank you for your time, support and patronage, and see you here!